Ed Swayze, 70, a loving husband and father passed away from Stage IV Melanoma on 1/9/17. It was only 16 days ago that Ed was admitted to the hospital with a tumor in his groin. Because the prognosis with melanoma is so bleak, the only options available were surgery or hospice. Ed opted for the surgery and sadly, due to uncontrollable internal bleeding, the surgery was not a success. In the days after surgery Ed was intubated and unable to communicate with Carole the urgency of their financial situation. 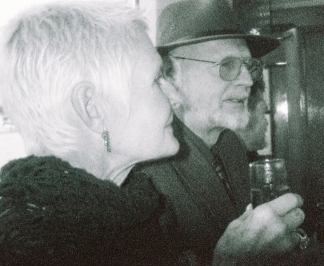 Ed was in hospice for only 1 day and passed away with his wife Carole by his side. Ed and Carole began a new trucking business in 2015, they invested all of their savings. Ed was working hard until the day he was admitted to the hospital and could not have foreseen that he would never return home again. His sudden death has left Carole in a severe emotional and financial hardship. Ed was an extraordinary man who lived an extraordinary life and didn’t let age deter him. A veteran of the Vietnam war, long haul trucker (at age 69 he had a fleet of 1 truck), retired Respiratory Therapist, animal lover, loving husband, and father. Ed had a profound impact on many. My daughter Madelyn was diagnosed with A.L. Leukemia at the age of 5 years old. On October 20, my families life changed for ever with one six letter word...CANCER! My husband, older daughter and I have watched our little girl battle everyday to smile and stay positive. As a mother, it is the most heart breaking moment when your daughter is in so much pain she cant hold her head up or so sick she cant speak. Maddy has so much love and support around her and I just know she will continue to beat cancer! Dorothy's diagnosis: Until Sunday the 13th of July we thought she was a normal little 2 + 1/2 year old. Happy and healthy, she has ALWAYS been. 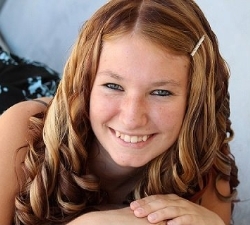 How our lives changed when we found out that she now is in the fight of her young life. It all started this way................. Sunday- a tiny bit of blood showed up in her urine, then a visit to the ER, an ultrasound (a mass was detected on her L-kidney ), in less than 1/2 hour we were in an Ambulance for a 100 mile ride to her Hospital in Santa Barbara. She was admitted immediately. Monday- tests and a CAT scan, which showed the mass was a tumor, massive in size in her L-kidney and had also entered the Ven-cava as well as residing in the R-Atrium of her heart. 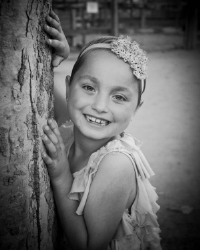 Tuesday- a PET Scan was performed to look for cancer anywhere else in this little Angels body. No cancer was seen elsewhere. The first breath we took for nearly 2 days. Wednesday- was surgery for a biopsy of the kidney in order to determine which cancer type is growing inside her. As well as the biopsy being performed an IV-picc line for her treatments was put in place as well as 2 temporary catheters. Thursday- more testing and cultures were done as Dorothy's fever issue was addressed. Waiting on biopsy results. Friday- Dorothy's cancer is identified as Stage 3 - Cancerous Wilms' Tumor (nephroblastoma) and resides in her Left Kidney and 2/3 of the Right Atrium of her heart. Chemotherapy was begun Friday and will continue for at least 28 weeks. "Thank you for being there when I needed you. Your genuine concern and encouragement helped me get through a difficult time. After battling prostate cancer for many years on my own, I thought I had finally won, and then got diagnosed with bladder cancer. This disheartening news started a whole new regimen of treatment starting with chemotherapy, and that is when you told me about Fighters 4 Life, and brought me a handmade coverlet to keep me cozy on the long days of chemotherapy for three months. You also visited me, and even took me to my doctor appointments on several occasions. When I awoke in the hospital after bladder removal surgery, you were there with a broad smile. You don't know how much that meant to me. That was two years ago, and another cancer operation (Kidney tumor) later, and you have been there all that time, willing to see me through the tough times, thank you." Hello, my name is Chelsey. I am a 19 year old college student, studying to become a veterinarian one day. I do pet care and small odd jobs to pay the bills each month. This is my story; On November 21, 2011 I noticed an abnormality around my left eye, thinking it was a simple eye infection and not having medical insurance I want to urgent care where it was diagnosed as an eye infection. The doctor proceeded to prescribe me antibiotic drops and told me to use them for a week. I used them for a month and noticed it wasn't getting better so as soon as my medical insurance kicked in I went to see my doctor where she prescribed a stronger antibiotic. After a week and no change she made a referral to an ophthalmologist. The ophthalmologist scheduled a biopsy of the tissue around my left eye on February 1, 2012. On February 8th, 2012 I was diagnosed with lymphoma which is also known as Malt Lymphoma on the eye. That honestly was the worst day of my life, thus far. I was out shopping with my mom when the doctor called to give me the news. My dad, sister, and boyfriend came with me to the consultation with the oncologist, where he told us about the cancer and proceeded to schedule me for a bone marrow biopsy. I was told on March 13, 2012 that the cancer is in both my eyes. My radiologist decided to try an antibiotic that has been proven to work about 50% of the time on this form of cancer. I complete the antibiotic on April 4, 2012. If it didn't do anything then when I see her again on May 10, 2012 we will discuss my other treatment options. I continue to stay strong and positive. I ask for positive attitudes and prayers in my life. The Fighters 4 Life Organization was introduced to me by a friend and has been wonderful with all the love and support they have given to me and all of the other cancer warriors. I would like to thank everyone who has contributed to the Fighters 4 Life Organization and for all the donations received, you all are wonderful people. I would also like to thank you for taking the time to learn my story. God Bless You All! "Life is a storm. You will bask in the sunlight one moment, be shattered on the rocks the next. What makes you a man is what you do when that storm comes. You must look into that storm and shout! Do your worst, for I will do mine!" I don’t know what I would have done without Jacky from Fighters 4 Life. There are moments in life when a bright light breaks through the darkest and scariest of times. Jacky was that bright light. She gifted me with her heart of compassion, a wealth of experience, extensive knowledge and continuous support during my mom’s 8-month fight with cancer. 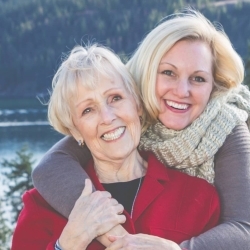 She lifted my soul and embraced my mom and family with invaluable help navigating a foreign world. My mom lost her battle of cancer, but we won irreplaceable moments and priceless memories in the process. Jacky helped us fight for life. Life isn’t death. It’s the moments in between that pierce the heart and soul with aliveness. Cancer doesn’t win. It changes the game, but it doesn’t win. She was Fighter for Life. Jacky fights for other people’s lives.